If you want to become an expert trainer, then keep in mind that Brainmeasures, a highly reputable company focused on providing the best online certification courses to the public, offers a trainer certification program which works in effectively honing your skills and knowledge in the field of training. With the help of this online trainer course from Brainmeasures, you will become more familiar about all the techniques that you can use when it comes to training people and developing the most reliable and comprehensive training programs for different types of people depending on their expertise and the kind of skills and knowledge that they wish to obtain. This trainer course also offers a more comprehensive background about the many things that you can do to become successful in the field. It aims to help you enjoy a more booming career as trainer after you complete this certification course. You have to take note, however, that before Brainmeasures will furnish you your hard copy trainer certificate, you will be required to take and successfully pass its trainer exam online which will serve as an effective assessment of the level of your knowledge and skills in the field. 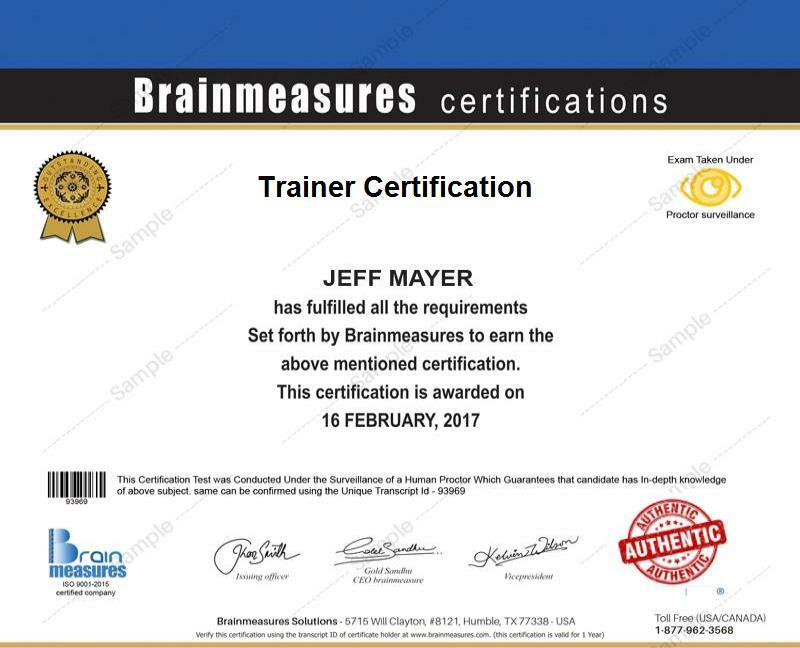 The trainer certification program offered by Brainmeasures can help individuals who dream of becoming a more effective trainer. It is primarily designed for aspiring trainers who wish to use the knowledge and skills that they get from a training program to train others and for existing trainers, HR personnel, coaches and training managers who want to make sure that they carry out their daily tasks and responsibilities in the most efficient manner possible. Salary for trainer certification holders is fully dependent on the specific field that they choose to handle. If you work as a human resource trainer after completing your trainer certification course, then you get the chance to earn an average annual salary of $68,000. Working as a corporate trainer, on the other hand, allows you to earn within the range of $32,000 to $60,000 annually. If you work as a training specialist, then expect your annual salary to be around $54,000.